I used to hold the belief that I couldn’t see energy or auras, while my S.O. has been able to see energy all of his life. Recently I decided that it was time to let go of that belief, since seeing energy just seemed like an opportunity to get to know reality in yet another new way. And not only let go of the belief, but choose a new belief where I was now learning to see it. Even though beliefs are ‘just beliefs’ or ‘just thoughts’, it’s amazing how different they can feel when you shift your focus – even the ‘small’ shifts. I selected some exercises from books I had and websites I’d bookmarked. I reminded myself that I had to play along and not dismiss something as an ‘afterimage’. (Even if an afterimage is present, it doesn’t mean it’s all afterimage, or conversely, all energy, so getting past dismissal overall in the early stages seems to be helpful. Discernment can get practiced later.) As I lay down to go to sleep, it took me a while to relax my usual waking focus to something more open and loose. At this point I have occasionally seen faint ‘sparkles’ in the room, which I think of as background energy. Then, in the darkened room, I held my hand up in the air with the ceiling in the background. I had to remember not to try too hard, and that I was aligning myself with the ability, not with NOT having the ability, or blocking it. I took deep breaths and let my gaze relax. 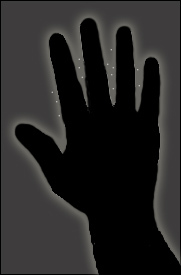 On a conscious level, I was expecting to see a very pale haze of lightness around the outline of my hand. Which I did! Although I had to watch for the immediate dismissal, which I mentioned above. But what I wasn’t expecting to see was tiny sparkles of white lights, mostly in the spaces between my spread-out fingers! (Brighter and more concentrated than the random sparkles.) Even better, since it was something I wasn’t expecting, it wasn’t something my left brain could dismiss as easily. Since that first time, I’ve been able to practice it a few more times. Each time I’ve had to take a little while to relax my daytime focus and tune into my intuitive faculties more. I’ll continue to practice, and as usual, see where it takes me. It’s fun to be stepping out into undiscovered experiential territory! Note: While browsing The LD4ALL Lucid Dreaming Forum, I found this article about using your attention to what the author called “phosphenes” (my ‘sparkles’ – wikipedia describes them as “A phosphene is a phenomenon characterized by the experience of seeing light without light actually entering the eye.”) to attempt to induce a lucid dream. Click here to read the article, complete with some really helpful images.